All by yourself, the drive to Pondicherry might be a bit of a drag. So, book yourself you a berth on a train to the seaside town. There are only a couple of trains that ply to and fro from the city so make sure that you book well in advance. The train journey is pretty convenient since you can catch on a full night’s sleep and arrive in Pondy early in the morning, ready to rock your holiday. If the Pondy trip idea has germinated at the last minute, the bus is your best bet. RedBus offers plenty of options so all you need to do is a quick booking and show up at your pick up spot. Want to get there in a hurry? Then, SpiceJet offers flights too. In Pondicherry, you can hire out bicycles and two-wheelers. Most hotels also offer taxi offers which is ideal if you want to stay away from the glaring sun. A tourist favourite, Pondicherry has stay options for every kind of visiter. If your wallet is slim, then, the sea-facing Aadhar Guest House is a steal at just INR 800. 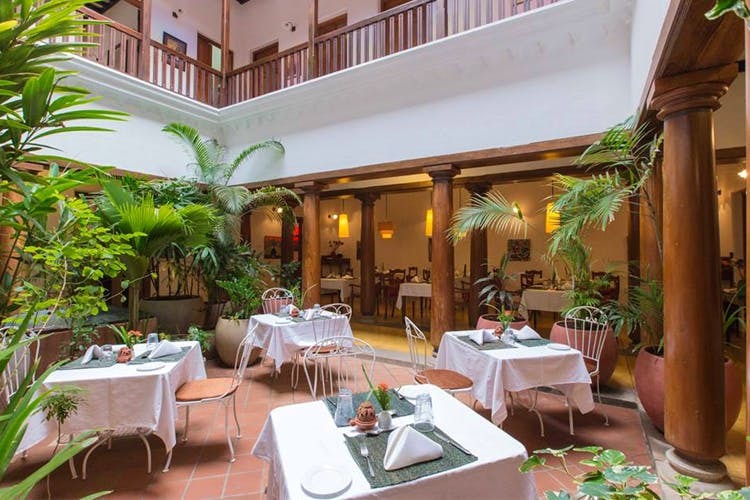 The history buffs among you will love Patricia Guest House, a 200-year old villa at the heart of White Town. Villa Krish, Palais de Mahe, Villa Shanti and Maison Perumal make for excellent options when you want to kick back in style. Spend a quiet morning just roaming the charming streets of White Town. You can gape at the lofty French-style edifices or take cute Insta selfies in front of buildings that are adorned with pink bougainvillea. To explore the town’s French heritage, you can also drop by the Pondicherry Museum that showcase artefacts from the bygone era. If you prefer to make a few friends while discovering Pondy, then, you can sign up for a cycle tour. The food is Pondicherry is spectacularly good. If you’d like to simply chill out, then, Cafe Des Arts is popular (here’s list of cool cafes) for its laid back ambience (complete with an old-world rickshaw) and its short eats. Bread & Chocolate, near Auroville, will reel you in with its freshly-baked loaves and sinful desserts. For lunch, Villa Shanti is recommended for a relaxed meal while Surguru is preferred for a quick bite. There’s plenty you can do on your own in Pondy. You can chill by the quiet beaches near Auroville or just outside Pondicherry. Or you can explore the waters with a diving expierience. You can meditate on a bench (or in the toy train) at the Botanical Garden or delve into spirituality at Auroville. In the evenings, you can meander down the Promenade Beach or watch the world go by on the busy Mission Street. A hub for indie labels and artisans, you can scour through boutiques, traditional craft centres, and decor stores in Pondicherry. At Kalki, you can pick up perfumes candles, silks, and ceramics. While Hidesign specialises in leather goods. For heritage fabrics, Casablanca and the Cluny Embroidery Centre are excellent picks.